*The abductor muscle is also called the foot. It is a small rectangular tab of fibrous muscle attached to the side of some scallops. 1. Season scallops with salt and pepper. Set aside. 2. In a sauté pan over medium heat add 1 tablespoon oil and heat until just shimmering. Add scallops and sear for 2 minutes or until golden brown. Flip and sear for an additional minute or until slightly opaque in the center. Set scallops aside. 3. In a clean saute pan over medium high heat add oil and sear chilled pork belly for 1 to 2 minutes on each side or until crispy and heated through. 4. 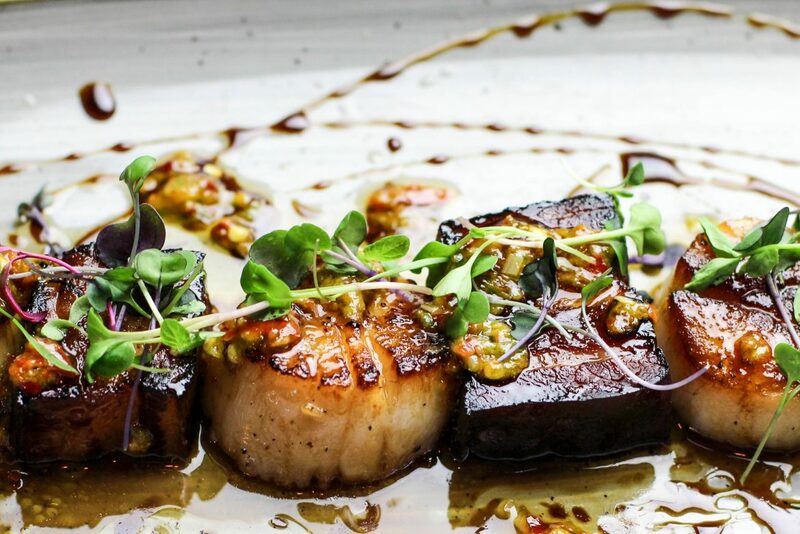 To serve alternate scallops and pork belly on a serving patter, drizzle with garlic chile oil and pomegranate molasses. Garnish with micro greens. 2. Place bacon slab in a dutch oven or roasting pan. Add water, soy, aji mirin and vinegar. Sprinkle in the brown sugar, peppercorns, star anise, cinnamon stick and bay leaf. Cover tightly (use a couple layers of tinfoil if you don’t have a heavy lid for your dish) and roast in the oven 3-4 hours. 3. Remove from oven, uncover and let cool in the liquid until it reaches room temperature. Once cool, put it in a Ziploc bag and refrigerate overnight. 1.Peel outer 2 layers of lemongrass. Trim top two-thirds (skinny part) and discard. Trim very bottom root end. Cut lemongrass in half lengthwise and then finely slice lemongrass into very thin half moons. 2. Place canola and sesame oil together in small saucepan over low heat. Add lemongrass. Cook on low for 15-20 minutes or until small bubbles from the lemongrass subside. 3. Remove from heat and cool for 10 minutes. 4. Add garlic, green onion, fish sauce and chilies. Stir well and allow to sit 30 minutes. Transfer to a small mason jar with a tight fitting lid and use as needed.